The so long awaited Axxis album is finally here. After a 2 to 3 years break, a catastrophic last album, the bands finally comes back. Even though it wasn't such a big surprise for us since we saw Axxis on Wacken 99'. The formation changed by the way... only Bernhard Weiss(vocal), Ritchie Michalski (drums) and Harry Oellers (Keys, Guitar) are from the original band. The new guys are : Guido Wehmeyer at the Guitar and Kuno Niemeyer at the Bass. For those of you who don't know Axxis (shame on you :) ), the bands came out of nowhere in 1989, actually they came out of Dortmund (Germany) releasing a bombastic surprise album called : Kingdom Of The Night (quoted 100/100 here, as a "Hall Of Fame" album), which was a big surprise to everyone at that time and sold 150'000 copies (not bad for a first album considering that at this period, metal wasn't very popular anymore). Everything went okay until their 4th album which slowly announced a change in direction for the band. Their fifth album "Voodoo Vibes" was a big catastrophe if you ask me. So here we are, with Back To The Kingdom which suggest that Axxis are back to the old Kingdom Of The Night style... but are they ? Answer on our next episode.... :) ... just kidding. Little atmospherical introduction, nice but... (biting my lips)... then a typical Axxis riffs makes you understand that : AXXIS ARE BACK !!! The first song is a fast paced melodic song like Kingdom Of The Night (in it's own time of course). Wow... first impressions : the sound ! it's crystal clear (it's always been the case with Axxis anyway :) ) but something changed a bit, the guitars are more "rock" and the sound slightly changed... perhaps because of the absence of Walter Pietsch on the second guitar. When the second songs began I was a bit afraid, Bernard started to sing like on the Voodoo Vibes album, but the melody is very catchy and the typical Axxis choirs waves on chorus immediately made me feel better (scared ya uh ? :) ). So it continues more and more with tracks like Heaven in Black which has radio potential and is a wonderful song... goes on and on alternating ballads with faster songs and you can feel Axxis' experience and wisdom... Although I waited for a first album copy I was nicely surprised to notice that this one is a synthesis of everything Axxis ever did... but holding on the first album style in the same time, like a boundary the band knows they can't break anymore... What's interesting and certainly gutsy to my opinion is that this hard rock sound belongs to the past, but who cares ? when it sound that good, and frankly it brings some originality out there. As always Bernhard's voice is simply and purely AMAZING !!! (after all he's my favorite singer with Toshi from X-Japan, Ralf Scheppers and Hansi Kurch) And after seeing them in "Wacken" I can tell you that Axxis performance on stage is incredible... so my advice is, if you have the opportunity to go and watch them play a live gig : just go (BTW they'll be touring with Pink Cream 69' as Headliners partners and Balance of Power as special guest ... should be nice ! ), you won't regret it, I guarantee you that ! Pretty good news for all Axxis fans, you can blindly buy this album. 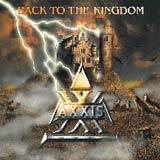 And for people that don't know Axxis, this one is a very good way to start listening to these melodic hard-rock heroes !